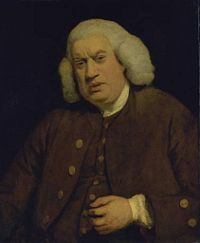 Samuel Johnson circa 1772, painted by Sir Joshua Reynolds. Samuel Johnson, LL.D. (September 7, 1709 – December 13, 1784), often referred to simply as Dr. Johnson, was an English poet, essayist, lexicographer, biographer, and iconic literary critic. Although his literary output is relatively meager—he wrote only one novel, one play, and only a small volume of poems—his intellectual breadth and contributions as a public man of letters were so imposing that the late eighteenth century is often termed the Age of Johnson. Johnson, more than any other author in English up to his time, became a public figure of tremendous fame and influence; he was perhaps the first author-celebrity in the English-speaking world. His influence on the opinions not only of his fellow writers but on every intellectual in England and the colonies was perhaps only equaled a century later by Coleridge. Johnson's hatred of slavery and the abuses of colonialism, his moral framework and notable acts of private charity, influenced later ethical novelists such as Jane Austen, Charles Dickens and George Eliot. Scholar H. W. Donner has said that no critic since Aristotle "carried more weight" than Johnson; and Christian thinker and novelist C. S. Lewis included Johnson with Jesus and Socrates as the three most authoritative voices in the history of Western moral culture. The Life of Johnson was published by his friend and biographer, James Boswell, in 1791. Johnson was the author of the early and authoritative Dictionary of the English Language (1755), which adopted the novel approach of documenting the changing usage of words. Compiled over nine years of nearly single-handed work, the dictionary provided definitions of more than 40,000 terms and included some 114,000 quotations of usage drawn from countless scholarly sources. The dictionary remained the definitive reference on the English language until the appearance of the first edition of the Oxford English Dictionary, published in installments from 1884 to 1928. The son of a poor bookseller, Johnson was born in Lichfield, Staffordshire. He attended Lichfield Grammar School. A few weeks after he turned nineteen, on October 31, 1728, he entered Pembroke College, Oxford; he was to remain there for 13 months. Though he was a formidable student, poverty forced him to leave Oxford without taking a degree. He attempted to work as a teacher and schoolmaster; initially turned down by Reverend Samuel Lea (headmaster of Adams' Grammar School), Johnson found work at a school in Stourbridge, but these ventures were not successful. At the age of 25, he married Elizabeth "Tetty" Porter, a widow 21 years his senior. In 1737, Johnson, penniless, left for London together with his former pupil, David Garrick. Johnson found employment with Edward Cave, writing for The Gentleman's Magazine. For the next three decades, Johnson wrote biographies, poetry, essays, pamphlets, parliamentary reports and even prepared a catalogue for the sale of the Harleian Library. Johnson lived in poverty for much of this time. Important works of this period include the poem, "London" (1738), and the Life of Savage (1745), a biography of Johnson's friend and fellow writer Richard Savage, who had shared in Johnson's poverty and died in 1744. Johnson began on one of his most important works, A Dictionary of the English Language, in 1747. It was not completed until 1755. Although it was widely praised and enormously influential, Johnson did not profit from it much financially since he had to bear the expenses of its long composition. At the same time he was working on his dictionary, Johnson was also writing a series of semi-weekly essays under the title The Rambler. These essays, often on moral and religious topics, tended to be graver than the title of the series would suggest. The Rambler ran until 1752. Although not originally popular, they found a large audience once they were collected in volume form. Johnson's wife died shortly after the final number appeared. Johnson began another essay series, The Idler, in 1758. It ran weekly for two years. The Idler essays were published in a weekly news journal, rather than as an independent publication, like The Rambler. They were shorter and lighter than the Rambler essays. In 1759, Johnson published his satirical novel Rasselas, said to have been written in two weeks to pay for his mother's funeral. In 1762, Johnson was awarded a government pension of three hundred pounds per year, largely through the efforts of influential friends. Johnson met James Boswell, his future biographer, in 1763. Boswell's Life of Johnson would in some ways become the most influential work to come out of Johnson's life, even though Johnson himself did not write it. Typical of Boswell's anecdotal approach is Johnson's famous refutation of Bishop Berkeley's Idealism. During a conversation with Boswell, Johnson became infuriated at the suggestion that Berkeley's immaterialism, however counterintuitive to experience, could not be logically refuted. In his anger, Johnson powerfully kicked a nearby stone and proclaimed of Berkeley's theory, "I refute it thus!" Boswell's biography, by serving as a compendium of all of Johnson's various thoughts and opinions, would eventually become the most cohesive testament to Johnson's talent and genius, and is inseparable from the academic study of Johnson today. Around the same time that he met Boswell, Johnson formed "The Club," a social group that included his friends Joshua Reynolds, Edmund Burke, David Garrick and Oliver Goldsmith. By now, Johnson was a celebrated figure. He received an honorary doctorate from Trinity College, Dublin in 1765, and one from Oxford ten years later. In 1765, he met Henry Thrale, a wealthy brewer and Member of Parliament, and his wife Hester Thrale. They quickly became friends, and soon Johnson became a member of the family. He stayed with the Thrales for 15 years until Henry's death in 1781. Hester's reminiscences of Johnson, together with her diaries and correspondence, are second only to Boswell's as a source of biographical information on Johnson. In 1773, ten years after he met Boswell, the two set out on A Journey to the Western Islands of Scotland, and two years later Johnson's account of their travels was published under that title (Boswell's The Journal of a Tour to the Hebrides was published in 1786). Their visit to the Scottish Highlands and Hebrides took place when pacification after the Jacobite Risings was crushing the Scottish Clan system and Gaelic culture that was increasingly being romanticized. Johnson spent considerable time in Edinburgh in the 1770s, where he was a close friend of Boswell and of Lord Monboddo; this triumvirate conducted extensive correspondence and mutual literary reviews. Johnson's final major work was perhaps his most monumental achievement, the comprehensive Lives of the English Poets, a project commissioned by a consortium of London booksellers. The Lives, which were critical as well as biographical studies, appeared as prefaces to selections of each poet's work that Johnson addressed. Johnson died in 1784 and is buried in Westminster Abbey. For Johnson, art, as well as thought and, indeed, civilization, required a moral framework. He believed that "he that thinks reasonably must think morally" and insisted on the necessity of moral awareness and responsibility as critical qualities of a mature person and a decent society. A Christian ethicist uncomfortable with dogmatic assertion, Johnson told Boswell that, "For my part, Sir, I think all Christians, whether Papists or Protestants, agree in the essential articles, and that their differences are trivial, and rather political than religious." Johnson was a compassionate man, supporting a number of poor friends under his own roof. He was a devout, conservative Anglican as well as a staunch Tory. Nonetheless, Johnson was a fiercely independent and original thinker, as much a unique thinker-for-himself as Milton or Blake, which may explain his deep affinity for Milton despite the latter's intensely radical—and, for Johnson, intolerable—political and religious outlook. Thus, although perhaps not as radical or inventive as the two poets, Johnson struck a sort of middle-ground, whereby his satires and criticism could utilize his poetic genius while at the same time steering clear of Blake and Milton's more overtly rebellious (and thus problematic) tendencies. Although not as singularly revolutionary as some of the other great poets of his times (such as Blake), nor as gifted technically as a writer to be particularly unique, Johnson nevertheless acts as a sort of gateway. Almost all the literature prior to him is filtered, by way of his numerous writings, reviews, and publications, and thus passed on to the subsequent generations that would become the Romantics. Hence, if one is to understand the history of English literature and the currents of English intellectual discourse, one must inevitably arrive at Johnson who stands right between the two major periods of English literature and is a critical link to both. ↑ After Britain's change from the Julian calendar to the Gregorian calendar in 1752, Johnson celebrated his birthday on September 18. Watkins, W. B. C. 1939. Perilous Balance: The Tragic Genius of Swift, Johnson, and Sterne. Boar’s Head Book 1st ed. 1960. Walker-deBarry. All links retrieved May 20, 2014. This page was last modified on 20 May 2014, at 16:50.